Wedding Band debuts tonight on TBS at 10 p.m. Eastern. 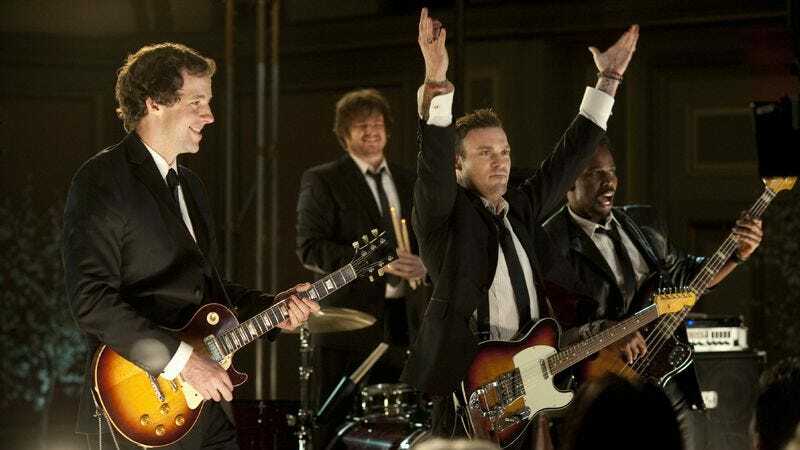 For a show that TBS seems to be all but actively trying to bury, delaying it for several months and tossing it on the air on Saturdays at 10 p.m., Wedding Band perhaps isn’t as bad as viewers might assume it to be. This is not to say that it’s some unheralded work of genius that everybody should run to check out right now, but by the standards of TBS original programming, it’s one of the better shows the network has put on in several years. That may be damning with faint praise—okay, it is—but the three episodes the network sent out all have a certain degree of confidence to them that’s impossible to fake. There’s a real show somewhere in the midst of this, and when the series relaxes a bit and lets it peek out, it can be a lot of fun. Let’s get the obvious out of the way first: Romantic comedy is really hard to do well on TV, because romantic comedy is rarely built for the long haul. It’s built for the quick build, the sudden climax, and the short denouement. Yet on TV, once Sam and Diane hook up, they’ll have season after season to realize how incompatible they are. The sheer amount of time a TV show has to fill means that it’s rare to get a properly paced and built romantic comedy arc—with the coupling coming at the very end—in the American system. Usually, the show falls apart so long before the couple gets together or the couple gets together so long before the show ends that the result is either viewers shrugging (in the former case) or the couple falling into various patterns of domestic bliss (in the latter case). Neither makes for entirely satisfying television. Wedding Band is, at its heart, a romantic comedy. It’s also got a number of other irritating tendencies that keep holding it back, like the way that it's never met a completely predictable romcom trope it won’t follow over a cliff. (In the second episode, the weakest of the three sent out, the main character’s love interest pleads with him to keep an eye on her fiancée at his bachelor party, and it plays out almost exactly as you’d expect.) It’s got all of its stereotypes covered, from the wild-man drummer to the perpetual bachelor afraid of commitment to the girl who’s gonna snag him to the overgrown manchild stuck in a marriage where his wife would rather not be married to an overgrown manchild. The female characters too often get the worst of it, and it’s only because they’re all played by such talented actresses that they’re able to come across as palatable at all. Yet Wedding Band has something that lots and lots of series that have overindulged in these romcom tropes in the past several years didn’t have: a palpable and ever-present sense of energy. There’s a light, frothy feel to the proceedings, and everything glides by so quickly and blithely that it takes a bit to realize that, yes, this show is really just hauling out every single trick in the book, most of which went stale long ago. The reason for that energy is simple: At the center of this show is the titular band (Mother Of The Bride), and though that band mostly just performs occasionally unusual covers of songs you already know, they’re really good covers of songs you already know. The four guys can sing, the music is fun, and the way the show uses it to keep things rumbling along is surprisingly effective. Tonight’s pilot opens with a five-minute montage that introduces all of the main characters to the strains of Brian Austin Green covering Gwen Stefani’s “Hollaback Girl,” and it’s just plain fun in a way not a lot of TV is. Wedding Band has apparently learned from Glee that a well-placed musical number can make just about anything more palatable. Wedding Band isn’t particularly funny, yet it’s hard to imagine it working as a drama or even a dramedy either. It’s built on the rhythms of TV drama, and at an hourlong, it sort of lulls viewers into complacency about how little they’re laughing, yet the rhythms are enough to keep it motoring along. Plus, it’s, weirdly, one of the few shows to have been inspired by the cultishly loved but little watched Party Down, in that every episode centers on some gathering or another that the band must play for and make awesome, with plenty of things going wrong at said gathering and the band having to help cover for the chaos via great music and pulling the strings for guests behind the scenes. The band visits weddings, bar mitzvahs, bachelor parties, funerals, and a high school blowout in the first three episodes, and there’s more than enough there to suggest how the show will work going forward. In particular, the high school party episode does a solid job of making the various teenagers at the party into credible characters, if still basic archetypes like everybody else on the show. That’s just the thing: If you come to Wedding Band looking for big laughs or something wildly original, it’s almost certainly going to disappoint. But if you come to it looking for a way to idly waste an hour of your Saturday night, you might have a good time. And, honestly, even if nothing else works, the band is always a lot of fun. Playing oddball songs, constantly switching instrumentation to fit the theme of the moment, and jumping around like the rock stars they aren’t, the members of Mother Of The Bride make Wedding Band hum along, both when it’s working and when it’s leaning too heavily on cliché. These are the guys who are too old to truly hit the big-time, and when they realize it, the band will probably break up. But until then, they’re going to make every event they play feel like the big time, and that extends to the show they’re the stars of.